I was flipping through a magazine recently and saw a Mexican restaurant, Lucha Loco, being featured. In the past, one of my only experiences of Mexican cuisine was at Magarita’s in Dempsey which I found decent but nothing exciting. Last year, I was invited to dine at Lucha Loco by a friend who swore this was the best Mexican restaurant in Singapore however I couldn’t make it. After seeing this feature, I decided to give Mexican cuisine another shot and round up my friends for a Friday night dinner and drinks at Lucha Loco. Lucha Loco is a casual and vibrant Mexican taqueria and bar. According to my American friend who has been here a number of times, the taqueria serves authentic gourmet tacos and Mexican street food whilst the bar offers a selection of Singapore’s finest tequilas, mezcal and cocktails including a number of fresh fruit margaritas. 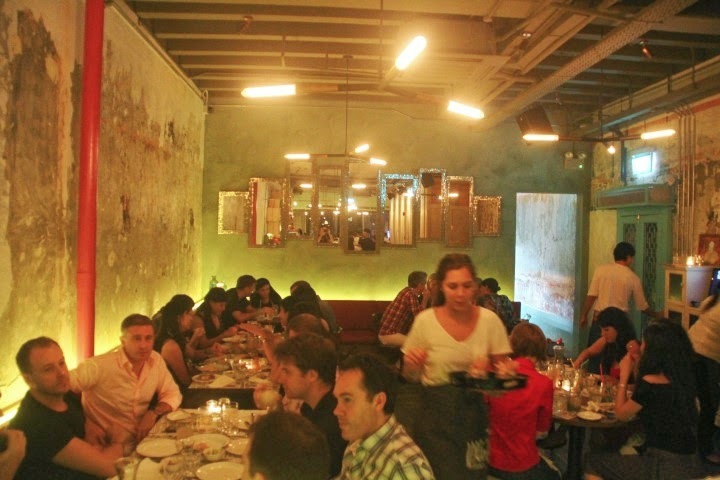 The lighting and décor is warm with the wash out walls reminisce of a rustic Mexican neighbourhood taqueria. There is an al fresco dining and longue area which is great for a night of conversations and drinks. For our entradas (appetisers), I started with the Elotes which is a Mexican street style grilled corn with a layer of mayo, chilli and cotija cheese and garnished with some chopped chives. I ordered this for my wife as my dad has been asking me to stay away from corn because it is not good for the health. I took one bite of this and his advice went out the door. 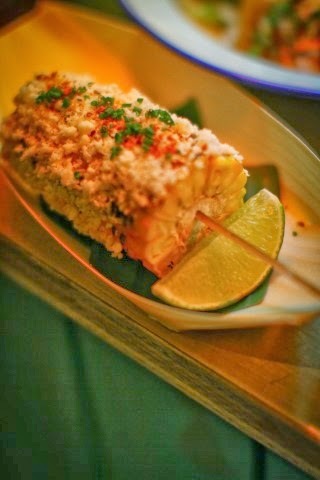 The juicy corn is sweet, salty, spicy and really delicious! The next dish I got was the tostaditas de res which is four bite size pieces of fried tortilla topped with dices of beef ribeye, green tomato, leek and capers. The leek was cut into thin strips and deep fried and along with the tortilla gave this dish a crunchy texture. 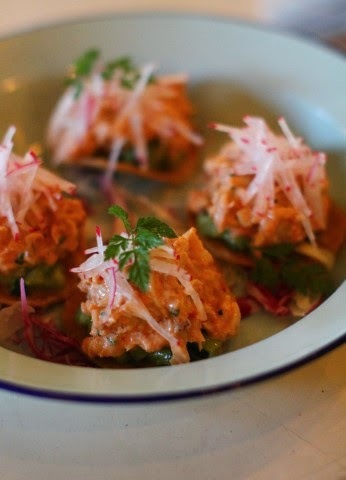 The last and favourite entrée was the tostaditas de cangrejo which is the same bite size fried tortilla topped with crab mayo, avocado, scallion and habanero oil. You put the whole tortilla in your mouth and you get the crunch followed by the sweetness of the crab and the ending kick of the habanero oil. 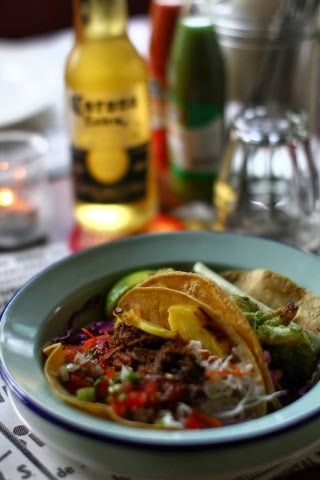 For our mains, we started with the taco de carnita. This is a soft taco stuffed with a strip of pork belly, shredded red cabbage, jicama and green colour cilantro mayo. Jicama is a large tuberous root from Mexico and South American and it is also known as Mexican turnip. The look and texture of the slices resembled radish with a crisp, sweet and nutty flavour. The dish was good but not as good as the baja fish taco which consisted of a battered red snapper, mango salsa, mint and cabbage. The crisp warm fish was heaven when paired with the spicy mango salsa. I ordered another serving just to confirm that I like it but I realise I don’t. I love it! The last taco we had was taco de chorizo con res which you probably can figure by now is taco stuffed with chorizo, braised beef brisket, spring onion and herbs. Needless to say the flavour of this dish packed a punch. The chorizo with the barbeque beef brisket gave this a smokey flavour which was balanced nicely with the chopped raw onions. The last dish I had was the costilla de cerdo which is pork ribs glazed with chipotle honey and served with pickled pearl onions. Chipotle is a smoked and dried jalapeno and it this instance it is made into a spicy meat marinade with some sweetness coming from the honey. The pork ribs were finger licking good. After doing some research, I found out that the menu for Lucha Loco was a collaboration between Consultant Chef Jason Jones, one of the founders and co-owner of the highly acclaimed Mexican restaurant Mamasita in Melbourne, and Executive Chef Mario Malvaez, (from Mexico City). The result is a delicious menu full of flavour. It is worth to point out the restaurant does not charge service charge yet the service is attentive and the dishes came out very promptly. The menu has been designed to share among the table and in small portions so that you can eat while you drink. The restaurant also turns into a hip party venue with DJ playing on Friday and Saturday nights. Good food, good drinks and good music. I can certainly see why so many people are going loco over Lucha Loco!